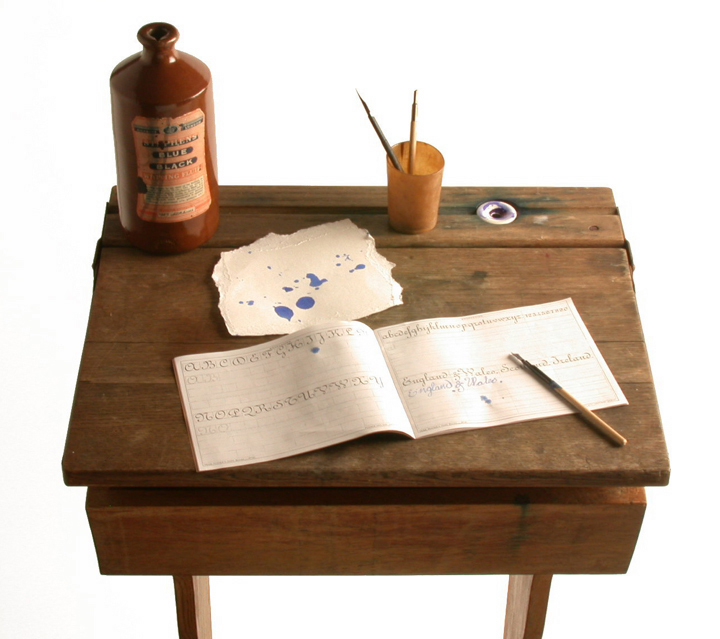 In the Victorian schoolroom, children progressed from using slates to using books, and to writing with an ink pen. Copy books were called this because children copied out the alphabet, or lines of writing, from examples they were given. They had to do several rows of copying. Through doing this repetitive copying, children were able to practice good handwriting, which was called 'fair hand'. It was important to learn good handwriting, as computers did not exist, and although typewriters were in use by the end of the 19th century, they were not widely available. This copy book shows on the front that it was number 10 in a series that included books for practising 'strokes, easy letters and short words' and 'sentences in writing of two sizes'. This book is for practising 'Plain and Ornamental Lettering'. Copy books would often contain short moral sayings to be copied out, such as 'Time and Tide Wait for No Man'. Ink pens were made from wood with a steel nib. Before this type of nib was invented, quill pens were used, made from feathers. Neither of these pens stored ink. They had to be dipped in an inkwell regularly, and this often led to blobs and blots, for which children were punished. This is the origin of the phrase 'to blot your copybook'.